The second round of Atlanta Motor Speedway's 2018 NASCAR Playoffs Superfan Giveaway has begun and with it comes a new prize: a prime camping and tailgating spot along the backstretch of Atlanta's 1.54-mile quad-oval during the 2019 Folds of Honor QuikTrip 500 weekend. 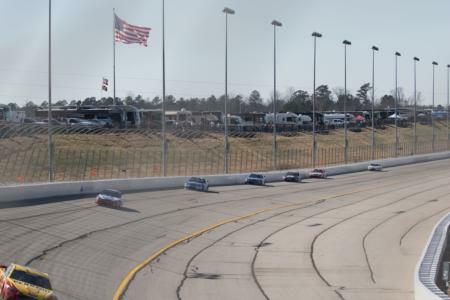 One lucky fan and three of their friends will be able to camp and tailgate for three days and two nights in one of the most coveted spots at the track, just feet away from the racing action. The ultimate camping and tailgate experience is the second of three prizes Atlanta Motor Speedway is giving away during NASCAR's playoffs to make the 2019 Folds of Honor QuikTrip 500 NASCAR weekend at Atlanta an unforgettable one for lucky fans. The winner of the ultimate camping experience will be chosen after the checkered flag drops for the penultimate race of the season on November 11; at that time the final round prize will also be revealed! Winner: Corey Barnard from Gallatin, Tenn. Entering to win is easy: Anyone who has already purchased tickets for NASCAR's Feb. 24, 2019, return to Atlanta Motor Speedway for the Folds of Honor QuikTrip 500 is already entered. Fans who purchase 2019 Folds of Honor QuikTrip 500 tickets before each prize drawing date are also automatically entered to win. Click here to see full contest rules and eligibility details. For more information, or to purchase 2019 Folds of Honor QuikTrip 500 tickets, contact Atlanta Motor Speedway at (770) 946-4211, (877) 9-AMS-TIX or visit www.atlantamotorspeedway.com.